Alumna of the School of Music's Community Music Division, Natsuki Kumagai, performs this afternoon as part of CMD Day at "Unveiled." 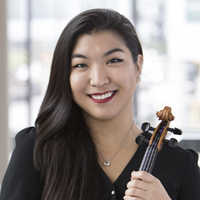 Alumna of the School of Music's Community Music Division and a member of the Minnesota Orchestra’s second violin section, Natsuki Kumagai will return to DePaul this afternoon for a performance on the Allen Recital Hall stage. Born and raised in Chicago, she has served in numerous concertmaster positions at orchestras including the New World Symphony and the Tanglewood Music Center Orchestra, where she was awarded the Jules C. Reiner Violin Prize. After her time in the Community Music Division, Kumagai attended the New England Conservatory in Boston where she studied with Boston Symphony Orchestra’s concertmaster Malcolm Lowe. She later received her master's degree at the Juilliard School studying with Ida Kavafian.